Our previous post brought you Dr. Christine Boyle, founder and CEO of Valor Water Analytics (Valor), which works with utilities worldwide to introduce technologies that drive efficiency and set a new bar for how utilities understand and utilize data. The analytics company has built a suite of software aiming to bring big data solutions to water utilities in order to improve their financial and water resource sustainability. Valor’s “Hidden Revenue Locator” product is widely recognized as a best-in-class technology for automated loss detection. Valor and its tools provide a fantastic example of how data can be transformed into useful information through the Internet of Things. The Internet of Things (IoT) has strong potential to transform the water utility sector. Water utilities in the U.S. spend over $2.8 billion annually on leaking pipes. More specifically, according to the American Society of Civil Engineers, that’s over seven billion gallons of water daily. How can this waste of water and money be detected and prevented? A short answer: the IoT. The (IoT), in short, refers to a vast network of internet-connected devices that enable users to collect and analyze data. Smart water meters use the IoT in order to detect leaks in water pipes, alert the utility, or allow utilities to view their water consumption real time. Generally, a smart meter measures consumption on a daily basis, and once this information is received by the utility, they can notify customers. Smart water meters and the IoT are on the rise throughout the country and world. 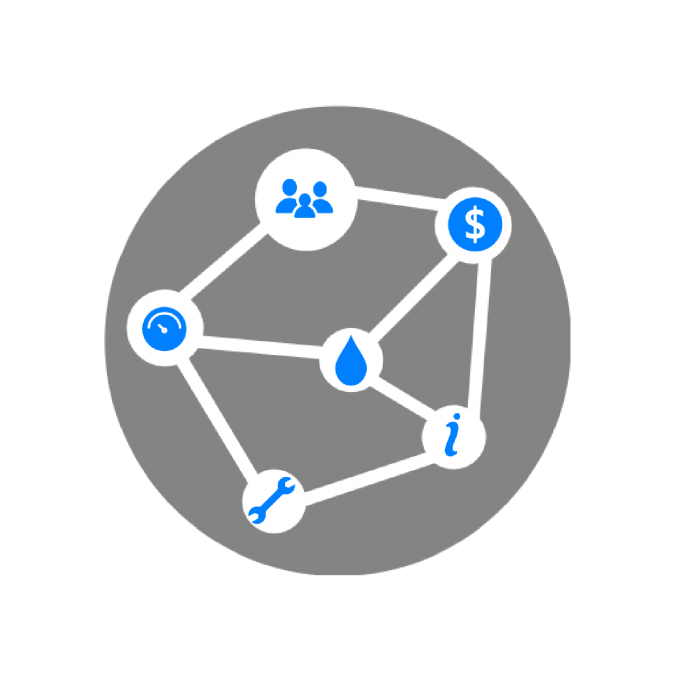 Global Market Insights expects the IoT smart water metering market size to surpass $24 billion by 2024, and is set to reach an annual installation of over 35 million units by 2024. But what does this growth mean for water utilities? When diving a little deeper into how these smart meters contribute to the daily work of a utility, it’s found that the data collected has the potential to lower costs for utilities. The first service which may reduce costs surrounds obtaining off-cycle, or “final” meter reads for customers moving or leaving the area. When customers relocate it may take weeks or months to collect their final meter bill. However, the smart meter will be able to read their real-time final meter, and the bill may be paid immediately online. Another way in which these smart services can lower costs for utilities is through remotely disconnecting or restricting the flow of meters (specifically in regions where this is permitted). Remote-disconnect meters reduce the costs to send field crews to the homes of customers who have either requested to be disconnected or are being disconnected. In addition, these smart meters can ensure utilities and their customers that bills are based on accurate meter reads rather than estimates. This in turn may lead to improved customer satisfaction and a more efficient system of operations management. An example of a utility who has found smart meters to be highly beneficial is SUEZ, a private water company providing services to over 7.5 million people in the United States and Canada. SUEZ completed a smart water meter case study in Bayonne, New Jersey. After installing over 10,500 new smart meters (which covered 90 percent of the city’s residents and businesses) SUEZ found in the first few months over 1,000 leaks on customer properties. These customers were unaware of the water leaks on their own properties, and after two years of installing the new meters, the water consumption throughout the utility had decreased by 7 percent. Miami-Dade County’s parks system has a similar story. The parks system is a sprawling one—the third largest in the United States—and includes 263 parks spanning 12,845 acres of land, including Zoo Miami, beaches, marinas, pools, golf courses, educational nature centers, and preserves. Not unlike other areas, the system was plagued with aging infrastructure that had to be manually inspected for leaks and other problems, weighing heavy on department resources. However, after installing new IoT smart meter devices, the employees could remotely monitor water consumption, detect leaks, and quickly manage problems. The department estimates that there was a 20 percent reduction in water use with savings of $860,000 per year following the implementation of the smart meters. Both examples show how the IoT can nearly instantly provide utilities with information about water usage, location of leaks, and save money in the long run, but it isn’t without roadblocks. The biggest challenge utilities face when installing smart meters is budget restrictions. Smart meters are more expensive than traditional mechanical meters and can be difficult for utilities to include in budgets. A Bloomberg Environment and Energy report notes that, out of 700 utilities surveyed, two thirds of the utilities cite upfront capital costs as the barrier to implementing smart meters. More specifically, a smart meter may cost up to seven times more than a regular meter. But the large upfront costs come with the potential for high-level, long-term benefits, as implementing a smart water system can help utilities recover up to 75 percent of water loss. Implementing the IoT is not something every utility may be able to afford (or even consider). But for utilities who can and are considering using these technologies, there may be large benefits in store in both financial and environmental nature. Elizabeth Kendrick is double majoring in Environmental Studies and Public Policy at the University of North Carolina at Chapel Hill. Elizabeth worked with the EFC at UNC as a Student Data Analyst during the summer of 2018, focusing on water rates surveys and Rates Dashboard projects. Outside of the EFC, Elizabeth is a member of the Undergraduate Honor Court, Student Government, and is a fan of Carolina basketball. customers reduce water consumption, the utility loose revenue. And for small utilities that rely heavily in a small customers base that could have a significant impart in their budget. Do you know what I mean? Also, from the point of view of small utilities, I was wondering if have any example of small or medium size water utilities were this technology could beneficial. The examples that you provided in your article are of very large utilities. Just a though. Thanks again!